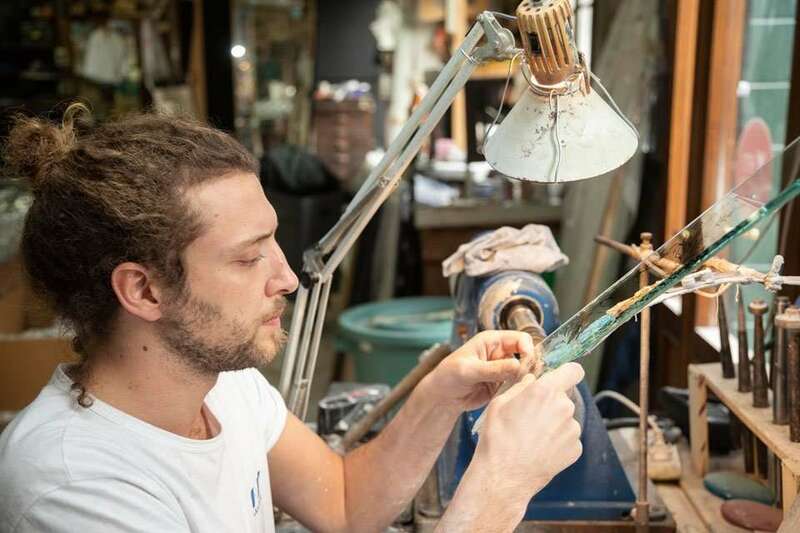 Vincenzo’s son, born in 1990, and today the youngest glass engraver working on Murano. After middle school, he attended the Liceo Classico Giovanni Paolo II high school in Venice. 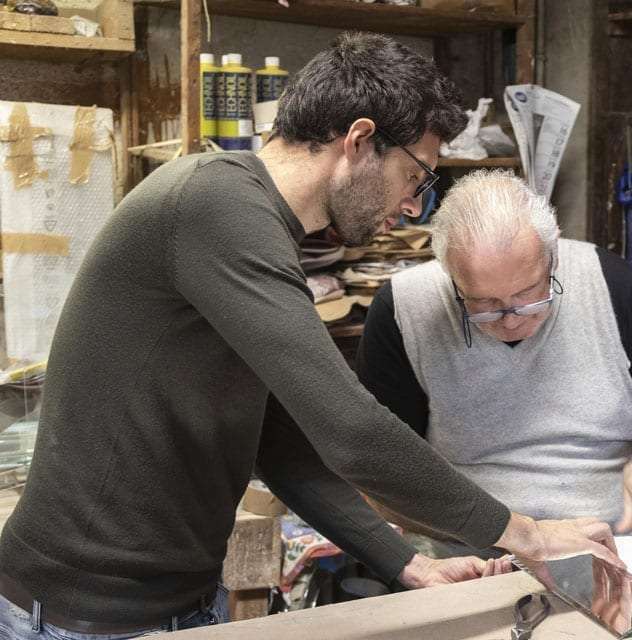 In 2009, after obtaining his high school diploma, and inspired by his particular attraction to glass and an innate artistic sensibility, he decided to join the family business, Artigianato Artistico Venezianosnc, now AAV Barbini srl. 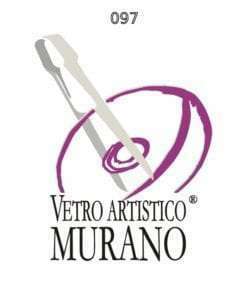 It is one of the oldest companies on Murano, specializing in the production of Venetian mirrors and fittings in engraved glass. 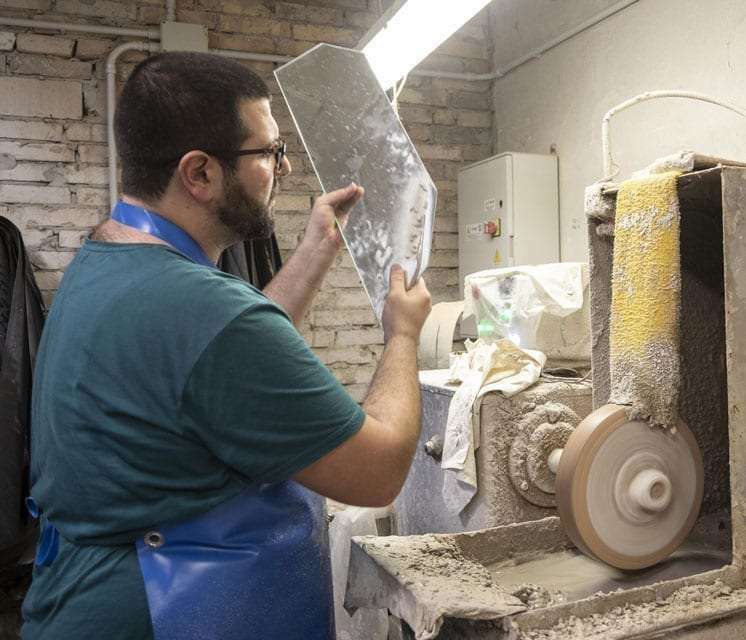 On joining the company, he began learning the various phases of creating a Venetian mirror, but he immediately found that the lathe was his ideal tool for externalizing all of his creativity. He would subsequently refine his engraving technique by working in the studio of the master engraver Luigi Cammozzo. Today he is the company’s head engraver. 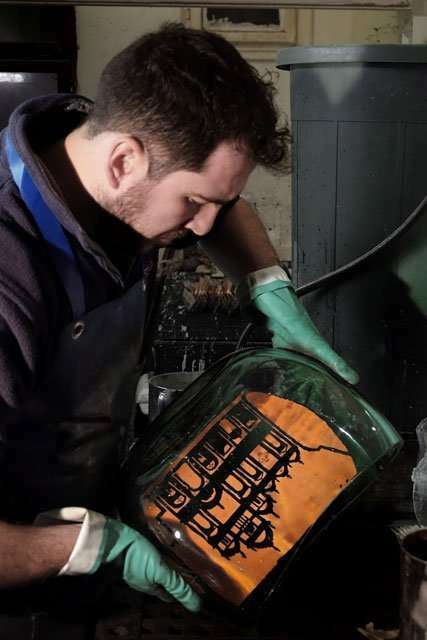 Over the years he has specialized in engraving not just on mirrors, but on plates, vases, bottles, sculptures and any other type of object – as long as it is made of glass! His desire to experiment with – and expand his knowledge of – coldworking techniques has led him to continuously study and refine the beaten glass technique, a process which has always fascinated him and with which he immediately enjoyed good results. Moreover, starting from 2018 he began to adhere, personally, to group exhibitions, dedicated to the art of glass, exposing some truly unique pieces. In 2018 he took part in the 47th edition of the GAS Conference, held in Murano, realizing two performances. 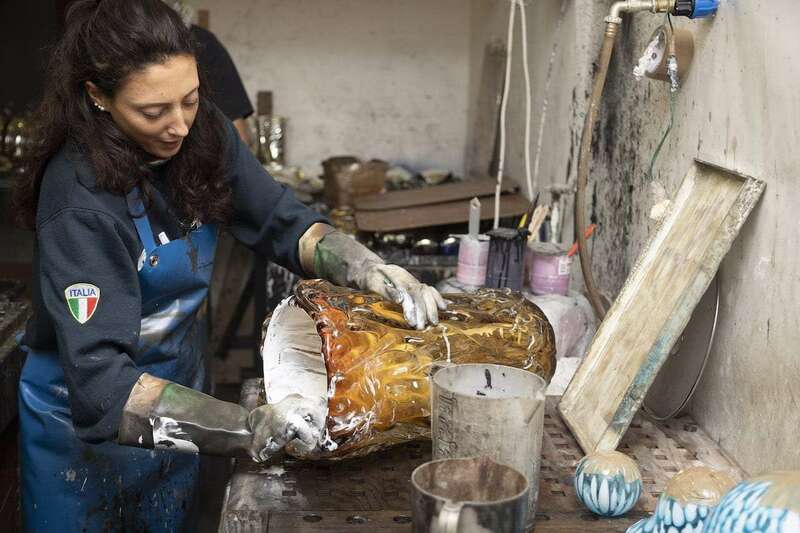 Son of Giovanni, born on Murano in 1987, he began working at Artigianato Artistico Veneziano in2004. Like all of his brothers, he came into contact with the world of glass at a young age, working during the summer holidays both in the family business and in local furnaces. In 2009 he obtained his high school diploma from the Istituto Tecnico per Geometri G. Parini. 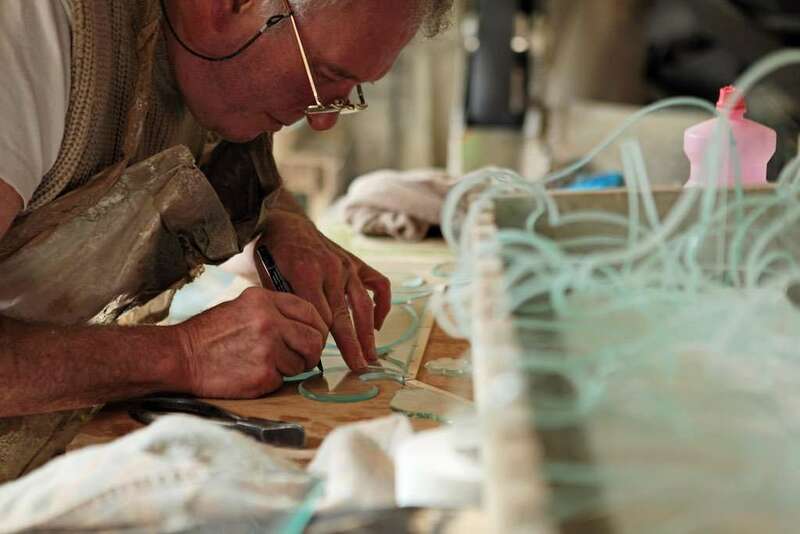 Today he is highly knowledgeable about all the phases of making Venetian mirrors, from bevellingto their assembly, specialising in particular in silvering, the procedure through which a transparent pane is transformed into a mirror. He also specialises in imitating antique mirrors. He is currently experimenting with the creation of coloured mirrors and vases decorated with figures taken from mirrors. Son of Vincenzo, born on Murano in 1984. Like his brothers, he learned about glass at an early age in the family business. His love of art led him to enroll at the Liceo Artistico in Venice, where he gained his high school diploma in 2003. He then took a painting course at the Academy of Fine Arts in Venice. 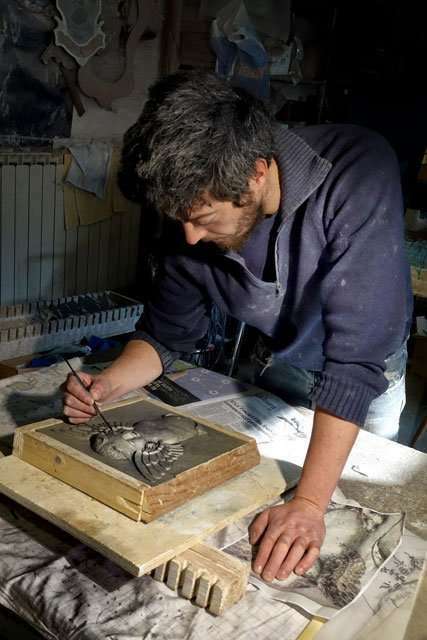 After a long period in which he had a variety of jobs, in 2017 he started glass engraving, taking private lessons with the master engraver Luigi Cammozzo in his studio. In January 2018 he officially became part of the team at AAV Barbini srl as an engraver. His arrival at the company led to an immediate improvement in the quality of our products thanks to his imagination and manual dexterity. He can go from drawing to painting and even sculpture with an ease and natural ability made possible by his fervent passion and innate talent, making him an accomplished artisan. Born in 1983 on Murano. Like his brothers he came into contact with glass at an early age, his first work experience taking place in the family business. On obtaining his diploma as an industrial technician, he enrolled at the University of Ca’ Foscari in Venice, graduating in philosophy and human sciences. During his studies, he held a variety of jobs, from artisanal work to transport, from commerce toworking in a press office, concluding with a six-year experience at the Fondazione la Biennale di Venezia, where he had the possibility to come into contact with the world of art. In 2014 he officially entered the family business, working in the sales sector and on the image of the historic company, bringing about consistent changes that are still in place today. 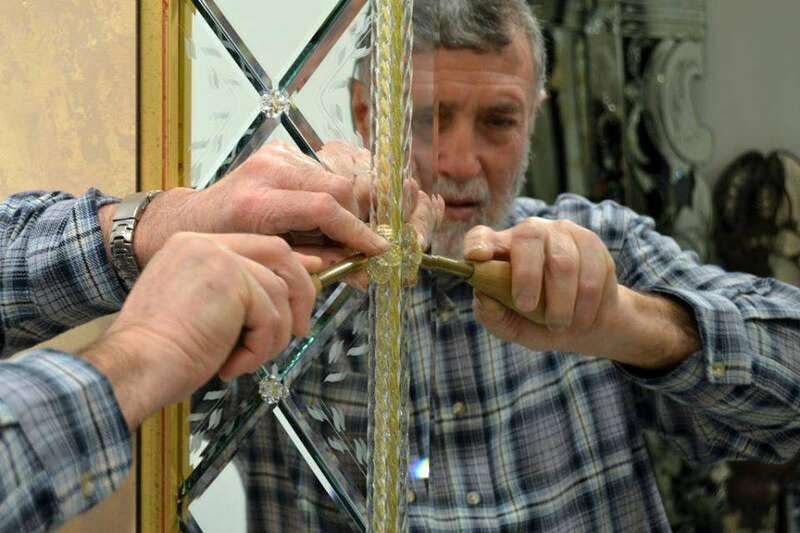 At the same time, his passion for glass art, which had grown over the years, led him to learn more about the various development phases of mirror making. He also did manual work in the various production sectors. Furthermore, due to his personal passion, for some years he has been creating both blown and solid glass bead necklaces, mixing the techniques of hot glass working with a wide variety ofcoldworking techniques, such as engraving, bevelling and sanding. Son of Giovanni, born on Murano in 1989. Like all his brothers, he got to know about glass as a youngster in the family business. After middle school, he enrolled on a course for electrical workers at the Istituto Berna in Venice. On gaining his diploma he immediately started working as an electrician, then as a plumber and even a furniture fitter for various local companies. In January 2018 he officially joined the AAV Barbini srl team as a beveller, immediately demonstrating his excellent learning skills and a particular predisposition to the sector he was assigned to. He is now a permanent member of the bevelling sector alongside his father Giovanni, who passes on his knowledge to his son every day. Son of Vincenzo, born on Murano in 1985. He came into contact with glass at a very early age, having his first work experience in the family business. He studied at the Istituto F. Massari in Mestre, where he gained a high school diploma as a surveyorin 2004. He then went to study at the University of Padua, obtaining a degree in civil engineering in 2011, specializing in hydraulics. In 2012 he became a chartered engineer. Over the years he has worked with various construction companies gaining technical know-how in the use of materials and in planning. 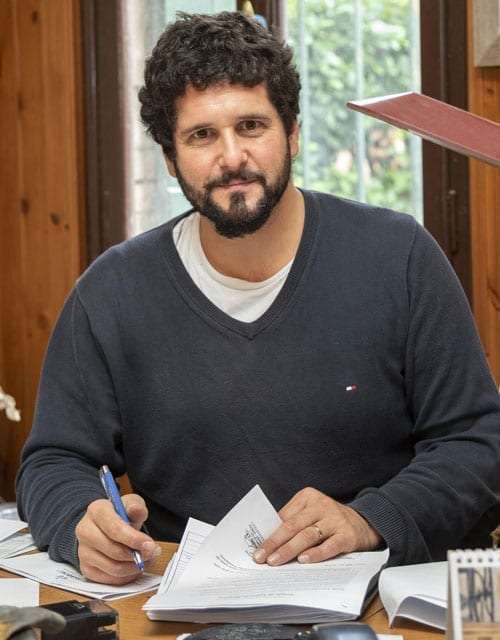 Between 2013 and 2016 he worked with the Regione del Veneto, first as an employee and then as an external consultant, involved in the management of European funding and in the field of hydraulic and geological risk. In December 2016 he became part of the work group for AAV BARBINI srl as an external collaborator, before entering officially in 2018 as a designer and planner, as well as head of managing the modern Water Jet, the machine which cuts with water. The Barbini company is the only business on the island to own a Water Jet. She is the only woman on the Barbini team! The daughter of Vincenzo, she was born on Murano in 1987. Like her brothers, she also had her first work experience in the family company. Whilst at school, she learned about the different phases of Venetian mirror making during the summer holidays. After gaining a high school diploma in accounting from the Istituto Tecnico Commerciale Paolo Sarpi in Venice, she worked for the Camerino Suppiej law offices. After other jobs, she officially entered the Barbini team in January 2019. She immediately showed herself to be a multitalented and versatile craftswoman, thanks to the experience accumulated over the course of her early apprenticeship. She is mainly involved in the assembly phase of the mirrors and also works alongside her cousin in the silvering sector.